On January 1st, D and I began a season of fasting. In order, we'll be fasting from money, meat, TV, sweets, internet, and alcohol. 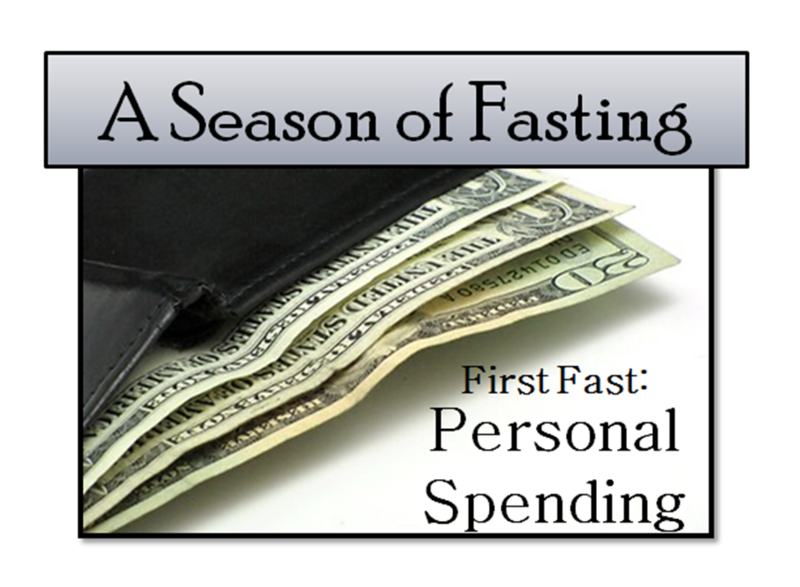 Each fast will last for six weeks so the first fast (money/personal spending) finishes soon and the next fast (meat) will start on the 15th. While D and I have slightly different reasons for doing these fasts, we both agree that we needed to asses our lives right now, as perfect and full as they are. For me, I want to winnow out what really matters, to challenge myself in the every day, to break out of bad patterns, to discover and encourage new good habits, to help me lead a more considered and thoughtful life. D initiated this fasting season and wanted to do it "to just shake up my personal perceptions of the world. Get out of the comfortable little routine. It's fine to go back to it, but once you've been without, you can judge what you really need. " Through this fast, I found that you can save a lot of money using creative solutions, taking time to research and not "mis-step," and just not buying impetuously. As an engineer, I see the real world advantages (and advertising gimmicks) of the more expensive things and I do appreciate the advantages and amount of work that goes into making finer things, but one should be careful when buying premium items. If you buy only the best all of the time, you will go broke. It is more cost effective to buy cheaply, give it a day in court, and then if that thing is something that comes to matter a lot to you, you can later upgrade. You may end up spending more money buying in at both the cheap and expensive level on that one thing, but it's more than made up for the fact you didn't buy in expensive on two other things. In addition, you have to have experience with the cheap stuff to appreciate the advantages of the good stuff. Another thing I learned, but not only from this experiment, is that there are so many things you can spend money on. We tend to want (be advertised into wanting) the big house and fast nice car, but one should really spend some time asking "how happy is this going to make me" vs how much does it cost. A nice, fast car "feels" cool to drive and you accelerate faster or tip up to some higher speeds on occasion but really, due to speed limits, you're driving the same as everyone else. Is it really worth that extra $25k? The brain is conditioned to become accustom to it's surroundings, and even tune them out. If you buy a nice house, you will marvel at it for awhile, but just like every living condition, your brain will pull it down into the category of "my house" where it's pretty much all the same as any other "my house." On the other hand, if you buy cheap and make continuous improvements...something is always new and appreciated. My thoughts on the personal spending fast: I didn't really struggle with this one like D did and mainly that's because I don't spend that much money on myself. If I spend money at all, I usually buy things for the kids or for the house, although I tried to curtail that as much as possible too for this fast. I broke the fast several times as well (not counting the much-needed shopping done in Honolulu- just clothes, no tattoos or beer for me): twice to go to bingo with friends ($30 each time), once for ice cream on Ebeye ($1), once for a six-pack of Mike's Hard Lemonade and a bottle of wine ($15), and once for a nice chocolate bar to have with my tea before bed ($4). In total, I spent $80 dollars on myself over a six- week period and didn't really feel taxed by not being able to spend more. If anything, the things that I broke it for point to how hard later fasts are going to be (I'm talking about you, sweets and alcohol!). Are you familiar with the prayer of Sir Francis Drake? Disturb us, O Lord... I have this prayer on my pantry door so I see it every day. It's my hope that this series of fasts will continue to disturb us, to make us question the easy parts of our lives and to help us discern what we really need. Have you fasted like this before? If so, what did you fast from and how did it go? What did you learn from your fast? Lent is approaching- are any of you fasting for that? I would love to hear about your experiences with this so please leave a comment below. I've never done a fast that lasted more than a day. I love the concept of the spending fast. I always feel like I don't spend much money on myself, but I bet if I fasted, I would realize that I do! I have never given up anything for lent before, but I am considering fasting from excess time on the internet. I do need to be online for work and for keeping in touch with my family, but I absolutely waste too much time. I have been trying to make most of my time, and internet usage is the area where I fail most. D doesn't spend as much time here as he used to- beer to brew, zombie TV shows to watch (there's some more transparency for you Andrea!). Thanks for stopping by- I miss you! I do like that prayer. I had forgotten about it, so I'm glad you linked to it. We're gearing up for Lent around here, starting Wednesday, and I'm trying to figure out exactly what fast would be most beneficial. I've never done a back to back one like this though- it sounds life changing! Can't wait to hear more about it. The prayer was in our bulletin at church one Sunday and I put it right up on my pantry door. I try to read it every day, especially since life can seem so "perfect" here sometimes. This fast wasn't hard for me since I"m not a big spender and the next one is meat, which also shouldn't be bad but after that, prepare for some angsty blog posts!